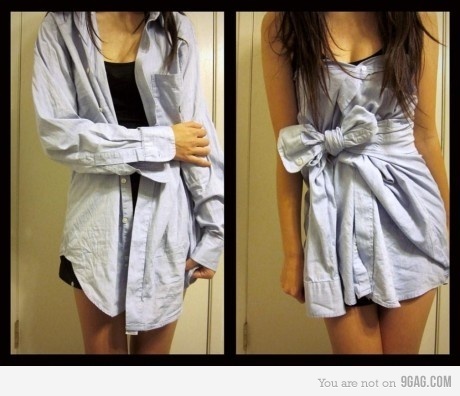 Ive got a crush on this mens shirt dress. We’re really into wearing things as dresses that weren’t originally meant to be worn that way in our sorority house. We’ve tried sheets, swatches of fabric from (yes) Wal-Mart, pillow cases (story to come later) and now it’s time to try this shirt shindig. Counting down the days until school is over and I go home to become blonde again! It’s time to change my hair color yet again; I’ve been a brunette/redhead for a year now. 3 weeks. I am keeping the deal with my roommate though- we can’t cut our hair. It’s difficult but we’ve both held out to get our long hair back. It’s sunny out again today! This entry was posted in College, Fashion and tagged bangles, bows, hair, menswear, summer. Bookmark the permalink.